E Arraial d’Ajuda, Bahia, the hotel is located on the street .Rua do Ipe 7, just in the center but far enough from,the Rua do Mucuje , to be able to sleep peacefully. In any case The “Rua do Mucujé,is at only only two blocks..and there you can find most of the best restaurants, bars and chic shops of Arraial…music is every were,all along the street. 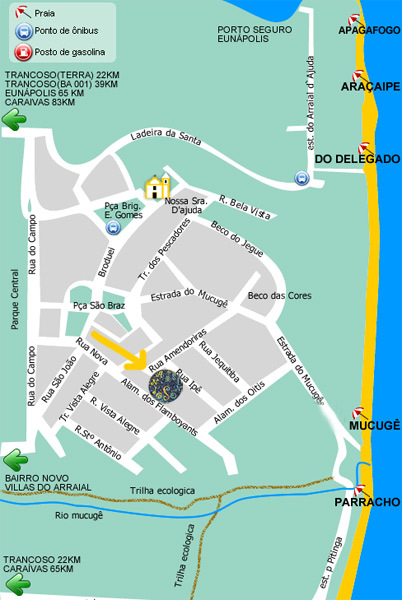 It is aproxiamately 300 m from S. Braz square and the beach. It is situated in the perfect place for you to be able to enjoy the ocean and Arraial ‘s t night life. Car – you should take the BR 101 highway, to arrive at Km 772, Eunápolis – State of Bahia, take the road that provides access to Porto Seguro, and in the Km 32, you’ll find, is right on the road giving access to the Festival d ‘Help, Or, go to Porto Seguro, where there are ferries (operating 24 hours) to reach the Festival d’Help. Bus – The Companies and White Eagles make the journey from Sao Paulo, Rio de Janeiro, Vitoria, Belo Horizonte, Brasilia, Salvador, Recife and from major cities in the north of Bahia and Minas Gerais. If found no direct passages to Porto Seguro, make a change at Eunápolis, where a bus company’s Blue Eagle leads directly to the Festival d’Aid, with the path distance of 60 km. Or go to Porto Seguro, take a taxi at the terminal by bus and head out to the ferry (they are, about 5 km, the price for the taxi is $ 20.00) or take a bus (the bus will leave the 400 m from the ferry). Airplane – As principais companhias operando para Porto Seguro são Gol, Web Jet e TAM. A distância do aeroporto para a balsa é de 4 km que poder ser percorridos de táxi. Da balsa até o nosso Art Hotel são mais 4Km que podem ser feitos em carro, moto, taxi, vans ou ônibus.
. Click here and see the map with the location of Art Hotel.
. Between here in the gallery of images and see photos of the Festival.
. Click to hear our Suites and Chalets.